Now that we have encapsulated the web elements in the page objects, most of the web document and logging in common utilities, and locators in enums, we have a test that is quite readable. You can see what page the test interacts with, and by using descriptive method names, you can guess what actions will be taken before the Firefox browser ever opens up the Login page. A new Firefox browser window opens up, if there wasn't one open already. The automated test asserts that the header text appears. A very important part is what gets written to the logs. Descriptive text detailing what section the test is in and what it is doing is very important, especially when the test failed and you need to quickly diagnose what when wrong. Was it a problem with the new test you added? Is it a problem with the server? Or is it a real, honest to goodness problem with the web application itself? Well written logs are quite important, indeed! Part One: We sketched out the simple manipulation of a login page using the login page provided by Dave Haeffner and his test site. Part Two: We began drafting a set of common utilities, refactoring the initial code, modelling it on what my workplace currently uses. Part Three: We talked about the different ways of storing constants: public final vs enums. Part Four: We talked about storing locators in enums. Part Five: We talked briefly about the Page Object Design Pattern. There are many topics in the code that I didn't cover in these six blog posts about "Testing The-Internet". Most of the topics I did not cover because, well, I am still quite new at being an automated tester. I've only been allocated at 100% to the automation department a bit less than the past two months. I have imitated the style of some of the following items that we use at work without fully understanding them, so I am not sure if I have mimicked them correctly. Know of a better way to do things? Let me know in the Comments! Is this the best way to structure the test suite? Is there a better way? Who knows! But this is how I did it in WebDriver_TheInternet_Advanced, which you can access on my GitHub account. Below is the folder structure I used, imitating what we use at work. The Java classes are linked back to the sample source code I come up for these introductory examples, hosted on Github.com. This is an example of me imitating something I have seen at work but still don't fully understand, mostly because I am still new to software development design patterns, and I am still unsure of the Factory Design pattern. 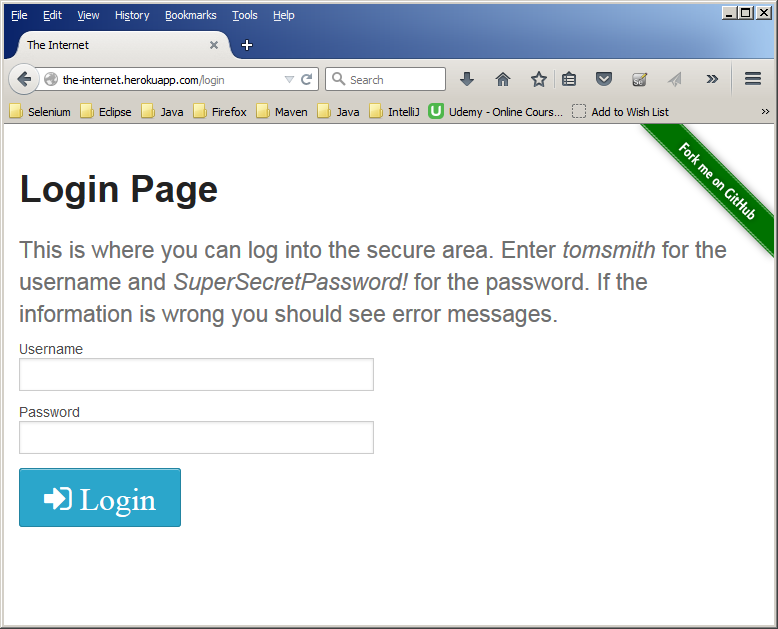 ... You are also creating an new instance of the LoginPage object and SecureArea object. This means that to call a page object and use a method, you just need to add the variable df as a prefix. Desired Capabilities: For this example, we are only using Firefox. I didn't need to set up a separate Firefox profile, Chromebrowser, Internet Explorer, Android, or Phantom JS. We also didn't need to set any ChromeOptions. Selenium Grid: Since we aren't running this test in parallel with other tests, we didn't need to set up Selenium Grid, or set up and start a RemoteWebDriver. SauceLabs: Since we aren't using SauceLabs to outsource our Selenium Grid, we didn't need any methods for getting or setting a Sauce session. TestRail: These tests are not data driven, so we don't need to get the value populating a "Browser" dropdown in TestRail, setting the capabilities. ... Quite frankly, I am not sure I even set up DriverUtils up correctly. All I know is that it seems to open a browser, go to the right page, and tear down the browser correctly. I hope you had as much fun reading about what I have picked up in the past two months as an automated tester as I have with writing about it!